The weekly U.S. average regular gasoline retail price has fallen by more than 40 cents per gallon since the beginning of September. EIA's forecast for the regular gasoline retail price averages $3.24 per gallon in the fourth quarter of 2013, $0.10 per gallon less than forecast in last month's STEO. The annual average regular gasoline retail price, which was $3.63 per gallon in 2012, is expected to average $3.50 per gallon in 2013 and $3.39 per gallon in 2014. The North Sea Brent crude oil spot price averaged nearly $110 per barrel for the fourth consecutive month in October. EIA expects the Brent crude oil price to decline gradually, averaging $106 per barrel in December and $103 per barrel in 2014. 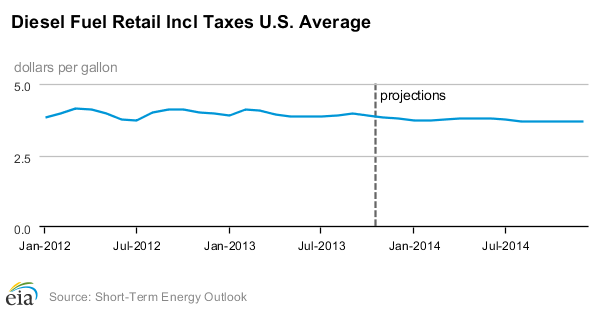 Projected West Texas Intermediate (WTI) crude oil prices average $95 per barrel during 2014. The projected discount of the WTI crude oil spot price to Brent, which averaged more than $20 per barrel in February 2013 and fell below $4 per barrel in July, increased to an average of $9 per barrel in October, driven in part by the seasonal decline in U.S. demand and the resulting increase in crude oil inventories. EIA expects the WTI discount to average $10 per barrel during the fourth quarter of 2013 and $8 per barrel in 2014. U.S. crude oil production averaged 7.7 million barrels per day (bbl/d) in October. Monthly estimated domestic crude oil production exceeded crude oil imports in October for the first time since February 1995, while total petroleum net imports were the lowest since February 1991. 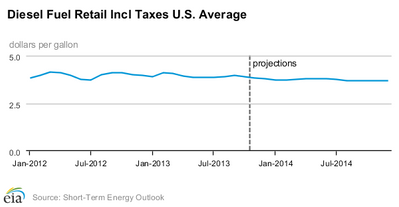 EIA forecasts U.S. crude oil production will average 7.5 million bbl/d in 2013 and 8.5 million bbl/d in 2014. Natural gas working inventories ended October at an estimated 3.81 trillion cubic feet (Tcf), 0.12 Tcf below the level at the same time a year ago but 0.05 Tcf above the previous five-year average (2008-12). EIA expects that the Henry Hub natural gas spot price, which averaged $2.75 per million British thermal units (MMBtu) in 2012, will average $3.68 per MMBtu in 2013 and $3.84 per MMBtu in 2014.